Following a major turnaround in coach Greg Lovelady’s first season, UCF Baseball has high expectations heading into 2018. Those expectations extend outside of Orlando, as the program was well-represented in this year’s American Athletic Conference preseason awards. 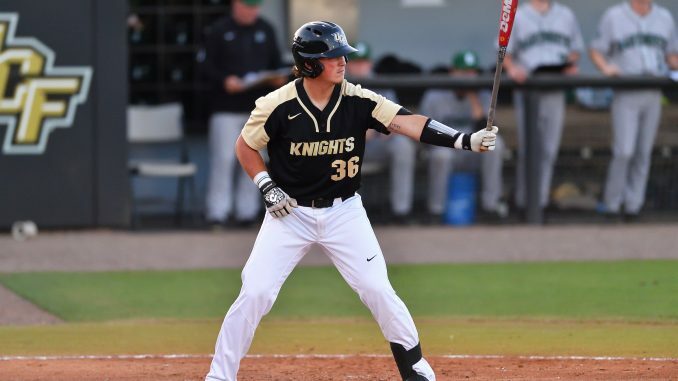 The biggest award of the preseason for UCF went to sophomore first baseman Rylan Thomas, who was named the conference’s preseason player of the year. He hit .303 in 2017 with 14 home runs, a program record for a freshman. He also put up a team-leading 53 RBI. After the season, the Windermere Prep product received multiple Freshman All-American honors. Heading into this season, Thomas is set to have a major presence in the middle of the Knights’ lineup. The preseason all-conference team featured four Knights: Thomas, junior pitcher Bryce Tucker, sophomore pitcher Joe Sheridan and junior infielder Matthew Mika. Tucker’s selection was unanimous, which came just days after being named a Collegiate Baseball Preseason All-American. The team was picked to finish third in the conference, trailing just Houston and UConn. In 2017, UCF earned the regular season conference championship, playing to a 15-9 conference record in addition to an overall record of 40-22. The Knights open their 2018 campaign on Feb. 16 against Virginia.